Developed by SICOMETAL the TURBO BLOWERS are designed to move in snow conditions. They facilitate the opening and expansion of roads. They are also suitable for loading trucks in the center of the ski resorts. SICOMETAL offers a spillways of snow to drive through PTO and suitable for tool holders manufactured in series. 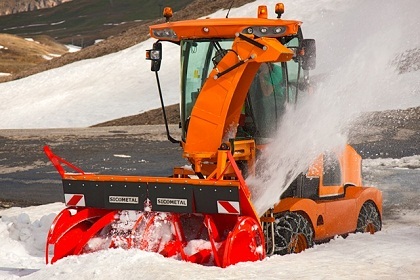 TURBO BLOWERS propelled the X-TREM four wheels have been developed for the removal of large amounts of snow in mountainous areas. 100% hydraulic technology is a guarantee of reliability. TURBO BLOWERS type W specially adapted for micro tractors and Agricultural tractors. They are designed to achieve outstanding performance with reliability . They are manufactured with high quality materials to withstand the toughest demands . They come to the end of the hardest snow and glacées.Les two spirals attack snow and guide towards the ejection turbine centrifugal snow and forcefully projected 25 mètres.Ils offer clearing width from 1.000 mm to 2.600 mm . They are available in various drum diameters and turbine discharge . Through their end bearings , you can do the work of widening the shoulder without straining trumpets bridge milling. The 280 ° rotating fireplace with loading valve (hydraulic optional) allows you to load a truck to remove the snow in urban areas. Coaching is done by the front pto tracteur.Il mounts to lift three points of the tractor ( W 550 series 1 and series 2 for other models) in case of overload or meeting with a foreign body on the cutter body , a torque limiter with automatic re- Inrush protect it. They are operating in an urban community, ski resort, in the openings of Alpine passes and airports . The TSI TURBO BLOWERS were designed to achieve outstanding performance with reliability. They are manufactured with high quality materials to withstand the toughest. They come to the end of the hardest snow and frozen. They offer a clearing width ranging from 2.500 mm to 2.800 mm. They are available in several diameters of drum and turbine discharge. Thanks to their end bearings, you can perform widening of shoulders without straining the trumpets bridge milling. The two spiraling attack the snow and to guide the turbine centrifugal ejection snow and plans to forcefully eject live 45 meters. Combination, triple output fireplace, offers a choice between right and left ejection direct or through a chimney rotary valve with 280 ° hydraulic loading. The training is carried out by front PTO the carrier vehicle. In case of overload or meeting with a foreign body on the cutter body, safety pins protect it. They are operating in a ski resort, in the openings of Alpine passes and airports.